Paul W S Anderson, the adventurous auteur-director who helmed three of the survival-horror Resident Evil franchise movies, brings the venture to an exhaustingly rapid "end" with Resident Evil: The Final Chapter. And although you might be thankful that the high and low anthology is finally "over", you won't like the fact that it, like most other editions of the RE firebrand, ends with little substance, depth or coherence. But then the pulp fiction (apparently Anderson's meteir), with its spellbinding post-apocalyptic cinematics, grotesque mutagens and zombies, a sleek mercenary and her high-velocity athleticism, gripping combat choreography, and fluid and fast-paced camera angles, is not intended to inspire Shakespeare. It was created for the low-hanging action junkie, and there clearly appear to be enough of them. Alice (Milla Jovovich, who is incidentally married to Anderson) wakes up amid a decimated Washington DC (probably a result of the dreaded battle foretold in 2012's RE: Retribution) and finds out that the organization she has worked for - Umbrella Corporation - was behind releasing the T-Virus that triggered a major extinction event on earth. Red Queen (Ever Gabo Anderson, Jovovich's and Anderson's daughter), Umbrella Corporation's bioweapons research lab HIVE's lead artificial intelligence (AI) bot and Alice's arch-nemesis, turns against her creators as she was originally coded to override commands that posed a threat to humans and save the species when the time comes. So, the AI, who is modeled after Alice and her sentience, tells Alice about an airborne anti-virus that will eradicate the disease. And it is available with the HIVE inside a vial. Alice escapes the nuclear wasteland (DC) and forms a team of survivor-rebels in a safe zone to obtain the anti-virus and stop Umbrella Corp founder Dr. Alexander Isaacs (Iain Glen, who plays Ser Jorah Mormont in TV series Game Of Thrones). But Isaacs isn't who he seems to be, and neither is Alice whose past is as elusive as the mystery behind the lost fragments of her memories since the original Resident Evil (2002). The Final Chapter (TFC) is a retcon, and that forms the crux of the plot twist. But being told in retrospective is not the film's weakness - the hasty direction which tries to ride the movie to an early grave, is. You can't help wondering how this film could have benefited from a slower and more cogent script while keeping the fiery-livewire Jovovich's impressive acrobatics intact. The entire movie is a rapid-fire round with Alice escaping ginormous zombie hordes, killing mutant humans and feral hounds, dodging typical Hollywood background explosions without as much as a scratch, zip-lining and grappling amid unrealistic backgrounds, and delivering hollow dialogues, all without telling you an articulate story. And this starts to exhaust even the audiences that came just for that. Perhaps too much of anything can be bad. Another way the movie could have been better is with more pondering on political expediency which it begins to explore with the ambitions of Umbrella Corporation and their influence on global politics which may have been the reason behind the ultimate "doom". But soon it subverts the ensuing political theme and uses the main man in question, Isaacs, played by a highly-skilled actor, only as the big, bad final boss. TFC almost fails on the sci-fi front, too. There is one vial of antidote for all species on Earth. The logic of the film is that since the medicine is airborne, it will be carried by trade winds across the globe and cure all the infected in a few years. They perhaps didn't mull over gas concentrations and their relation to diffusion rates. That amount of medicine in a 2-inch (diameter) test tube would probably be enough for a family of four and would evanesce within a few cubic metres of volume. A proper explanation hasn't been provided by the creators. But on the plus side, it has ideas on how the humans can hide out in cryo-chambers deep in the heart of the earth during events of mass extinctions. 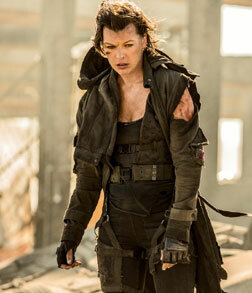 Ukrainian actress Jovovich proves her inner mettle once again in this highly empowering role. While a few stunts were performed by a body double (Olivia Jackson), Jovovich's own moves are swift and blindsiding. She fits into the character of a cybernetically enhanced woman built only for two purposes - running & killing - perfectly. Her emoting is wooden during the fight sequences, but that is just how Alicia the character is supposed to be. Iaian Glen enhances Jovovich, and is himself egregious. He carries part of the weight of the crumbling movie on his shoulders. It is difficult to see him turn into a villain after donning the role of a loyal, atoning knight in GoT. The rest of the supporting cast have little to do and appear only as Alicia's sidekicks, and the film's scapegoats, as they all perish one by one. Glen MacPherson's cinematography blows you away with the rapid stop-and-zoom camera angles, artistic rendition of gadgets and vehicles, concept creatures that look close to sci-fi macabre artist H R Giger's works, and the entire litho-rendition of the doomsday scenario. The movie has been shot by The Red Epic camera system in 4K resolution on 2D, and then digitally remastered onto 3D. This gives the cinematics the futuristic feel necessary for a movie of this genre. If the visuals aren't pleasing enough, Paul Haslinger's beats and riffs are engaging and give some tense moments. His soundtrack, although not even close to the original video game's melancholic doom, empowers the innumerable jumpscares. Oh, and for those wondering about the double quotes on "end" in the intro of this review, you will find out why, at the end of the film. This movie will not be a smash hit among critics or those who have played the original game, and fails to end the series with a bang. For those who like only shock-value and Jovovich, it is a good one-time watch. Viewed this movie by booking tickets using bookmyshow ; on 5th Feb17, late night show timing. The movie was in 3D which was a pain for a person with spectacles. Milla Jovovich was what she was in the prior movies in the Resident Evil franchise; though I liked her better in the first Resident Evil which was what I viewed. As is the norm franchises are better in the nascent stages; for ageing is a pain in films. fullhyd.com has 700,000+ monthly visits. Tell Hyderabad what you feel about Resident Evil: The Final Chapter!